A dominant Lhasa Apso's growling is worrying its owner. The Dog Expert has a few suggestions for stopping the aggressive behavior and handling the situation in ways that will put this family pack back into proper order. Any time I scold my female Boxer, my male Lhasa Apso comes from anywhere in the house to growl at me. They get along fine, but these dogs are not close friends. They don't sleep together, play together, etc., so I don't think he is trying to protect her. We've had many previous dominance issues with the Lhasa. Any thoughts? 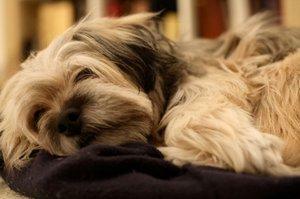 Lhasa are one of my favorite breeds, but they can be a handful. It sounds as though you have yet another dominance issue on your hands. Although your Lhasa Apso may not seem especially fond of your Boxer, he certainly views the two of you as part of his pack, a pack that he believes he's the leader of. His response to your scolding of your other dog is that of an Alpha male settling a dispute between two lower pack members. He's intolerant of what he views as aggressive behavior on your part, even though you're merely scolding your Boxer. I suggest that you behave a bit more firmly with your Lhasa when he challenges your authority in this manner. Give a firm "No" so he understands you're not pleased, and then give him a time out, either in his crate or in the bathroom where you can close the door. Keep him confined for about 15 minutes or until he settles down. This teaches him that you are in charge. After a couple lessons like this, you should see an improvement in his behavior. As a further measure, it would be wise to take your dog to obedience classes. He will learn to look at you as his leader and then be more willing to follow your commands. Thanks for your question, and I hope you find these suggestions useful.